STEM OPT Extension Rule Making Process have Began. So, how long would it take for Department of Homeland Security to complete and implement the STEM OPT Extension rule? I have witnessed the H4 EAD Rule Making Process. I have timeline listed from Feb 2012 till the rule become effective on May 26, 2015. But, we don’t have two years for STEM OPT Extension rule to be implemented. Feb 12, 2016, is the deadline. 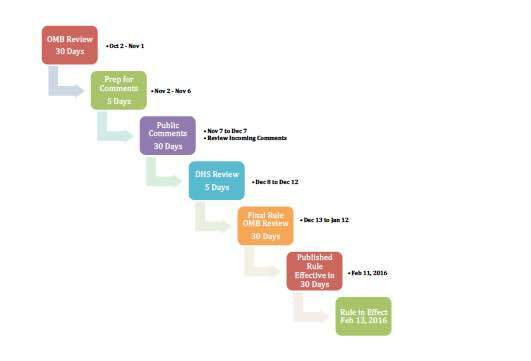 I created a realistic timeline based on observing the H4 EAD Rule Making process. And what to expect during STEM OPT Extension Rule Making process. As you can see, there are several steps in this Rule-Making Process. If OMB approves the Proposed Rule, it can help DHs with the new timeline as per Video 2. Input for the second video came from AILA Blog post. How long does OMB take to approve the Proposed Rule? From what I read there’s no minimum time but it can take up to 90 days to review and approve a proposed Rule. OMB completed the review in 12 days (Oct 2 to Oct 14, 2015). What if there are more negative comments than positive comment during Rule Making Public Comment period? DHS doesn’t publish a rule solely based on the total number of positive vs. negative comments. How long is the public comment period? I’m assuming DHS will do a 30 days. They have an option to 60 days as well. DHS should consider comments concurrently as the public is commenting. We still don’t know what’s included in the Rule. STEM OPT extension may be for 17 months, or it could be increased to 24 months or even longer for 6 years. Subscribe to YouTube Channel to get notified of more video updates. When new details become available, I will be the first person to interview an Immigration Attorney to bring more details about the Rule. Got questions about STEM OPT Extension Rule Making Process? Let m me know through the comments section. And Please do share this blog post with your friends. My opt expires in feb 2016 and my company will be filling for my H1B this year.So,can i stay back in usa?Till any result is out about opt rule extension. My OPT Extension will be expired in Jan 2016. Will I be eligible for 7 months extension if the rule becomes final in Feb 2016? First things first, you are doing a wonderful job. I can say how much, people would appreciate this. Keep updating us. Now that OMB has approved the rule, has it been published? If yes provide a link. Else when do you think it would be published. Few comments back, you said the number of positive and negative comments are not the basis for the decision making process. Then what is? How are these comments evaluated towards the final verdict. With this pace and situation, can we strongly believe that everything is going to be good? Arul – I’m doing a show with Attorney Murali today at 8 AM. New update will be coming your way around 9 AM today with more details on Rule Making. why is DHS not buying more time from court ? Now, we are all aware that DHS cant activate this new rule by Feb 12th. why do you say DHS cant activate this new rule by Feb 12th? Maybe someone has already asked this question on this forum, can you please explain what does USCIS mean by “Expanding Cap-Gap Relief for All F-1 Students With Pending H-1B Petitions”, as it mentioned in the proposed rule title under OMB review. Does “Pending H-1B Petitions”, means for leftover students who didn’t qualify lottery this year, USCIS will give some relief? Don’t confuse this with any H1 regulations. This is purely cap-gap relief which is also stuck down with court order. Cap-Gap: H1b filed and OPT expires before Oct. Cap Gap provision will allow those folks to continue to work till Oct 1.
why are you saying CAPGAP is stuck with court order?It is only stem OPT extension right ? and lets say the student OPT expires on April 30th 2016. Can he/she work in capgap, till they get result on their pending H1-B petition, irrespective of court ruling and new rule making process right? As per my knowledge, the CAPGAP is not affected by this lawsuit, it is only stem opt extension of 17 months right? and Kudos for all your great work Buiddy! now we are pretty sure that DHS cannot activate this new rule by Feb 12th 2016. Can DHS at least buy some more time from federal court or high court? So that this time can act as buffer, till new rule comes into place. Employers will be really pissed off, if full time F1 students say, i cant work from this date. Every one know that, out of 100 job applications 1 employers comes forward and says he will sponsor after conducting at least 3/4 rounds of interviews & now finally this immigration screw up, when people are really trying to establish their place in the team by proving themselves for working at least 12 hours per day. Can F1 student stay in the country legally, when his OPT has expired by end of April and when his H1B petition is pending ? Lets say the H1B is approved, can he/she stay in the country till Sep 30th and start working from Oct 1st ? I think yes (but I have to check with Murali). @Raghu Without cap gap he will go out of status right? With capgap one can work, without cap gap can they stay? I don’t know. Yes if your OPT expires on April 1 and assume you have filed for H1B – you can stay on in the US. You cannot work. If USCIS returns your package – you go out of status and must leave. If USCIS tells your petition is selected – you may continue to stay in the US (but cannot work) till Sept 30. From Oct 1 you may begin working. I would suggest leaving the US. If you are selected in H1B, enter back on Oct 1 on H1B status. Why do you want to idle around for 6 months here doing nothing? Haha, this is all a ploy by the government to extend OPT period. The rule is going to go through 100%. Everything is happening just so it all happens just before Obama goes out. Coincidence? Also, DHS has the ability to request for additional time beyond Feb 12th. Don’t worry guys. THIS IS HAPPENING. Where is your link? Where is the attachment, are you a 3rd party IT consultancy firm owner? You have their telltale marks of being a prolific liar !!! i am not any of the ones you mentioned, i am also one of the victim of federal court ruling. I saw the pic. Read between the lines. Card can be valid (if and only if Court agrees tot he new Rule Making Policy). Analogy: F1 visa stamping is valid for 5 years, but your status is based on I-20 validity period. Can you explain what do you mean “if and only if Court agrees tot he new Rule Making Policy”. Should DHS get the approval from the Court, after it finishes the rule making process? The process doesn’t end once the rule is published in the federal register, after notice and comment period followed by OMB review. Court vacated the rule. DHS have to follow the process and implemented the rule and have court rescind the order right? So that is again a biggest hurdle for DHS, to get the new rule making policy accepted by court. Because WashTech arguments will be taken into confidence, before court gives out the final judgement right? I’m not sure how this is going to play out. They have filed another appeal to higher court. Watch the new video in the same page. Any international student who is currently on STEM or will be applying for STEM, please disregard the date /timeline as mentioned in the video… Even if DHS is not able to meet the deadline, there is a very high probability that DHS can ask for an extension and the date will be pushed forward. I do not agree a bit with the video posted by “Raghuram Sukumar” as I am not sure what he means when he says “in his experience of h4”. This is totally a different issue than granting EAD to h4. Also since election is due, it will have very minimal effect on the new rule making. So please anyone who is on on STEM or will be applying for STEM, DON’T PANIC…. Within the next thirty days we will provide public notice of a proposed rule to strengthen the program that provides optional practical training for students in STEM fields studying at U.S. universities. This is good news. Thanks for sharing. Hi Raghu….How come this is a good news…..as per the discussion in your video the rule should be available for public commenting before October 15 and here the secretory of homeland security is saying that the rule will be available for public commenting after 30 days. The rule came on Oct 2 so as per him the rule will be available for public commenting on Nov 2 (30 days). This will miss all the deadlines you mentioned in the video.So is it a bad news or a good news? What you described is Bad News. Good News is DHS can get a Stay and extended the Feb deadline since WashTech have appealed the lower court ruling. Which will give them more them to complete this Rule-Making Process. Raghu pardon me but I find your answer contradictory…..
Firstly you are saying that DHS can get a Stay and extend the Feb deadline since WashTech have appealed the lower court ruling. And then you said that lets hope that the pending lawsuit will be dismissed…..
My qestion is that if the lawsuit in higer court is dismmised, then how will the DHS bring a stay after February since there will be no pending case in the higher court…. Moreover as per what the DHS secratory said, it is gonna take 30 days for public commenting to start. This will already miss all the deadlines you mentioned in the video…..
You mixed up the timeline. Lower Federal Court vacated this STEM Extension. But, this pending lawsuit is challenging if DHS even authority to making this OPT Rule (and other things). If there’s “NO” decision on that by feb 12, 2016, then DHS can ask for Stay of decision passed by lower court. I am clearly aware about the pending lawsuit in higher court which challeges the authority of DHS to even do rule making. It even challenges the 12 month initial opt. I have studied it in detail. But my question is totally different. You said lets hope that the law suit is dismissed. But ideally we should not hope like that. We should hope that there is NO DECESION on this new lawsuit till Feb 12. Because if it is dimissed, than the DHS has no chance to ask for an extension in the lower court as there will be no pending case in the higher court. I know I am going into the minute details but I think a technical discussion like this is benificial for everyone who understands the rule making process thoroughly. Bigger Picture: If that lawsuit is not dismissed, we have much bigger problems right? In Football terms: We have to score to win, but don’t score with 2 minutes remaining. Let’s kill the clock and then score. Pls could you send the link to this official statement made by secretary Johnson ? Otherwise how do we know that you are another lying Indian IT laborer ? Maybe you saw this in your dreams ? So it is good practice to give the link to his official statement …. Is this what all these of education taught you? It would have taken less than 2 seconds to find and answer of you used google. Harsha…Dude you are the same wannabe person who was advising everyone to marry an American citizen to get green card…. I don’t know if you ever went to a school anytime in your life and you have any freaking knowledge of what we are trying to discuss here….we are talking in details about a rule making process to avoid a big disaster with technical students like me who are following the right path to immigration….I know this will go way above your understanding level….and for the question you asked Raghu, I want to tell you that you are really disgusting….even a first grader can use google and find this authentic information in less than a minute….so I sincerely suggest you not to peep in with your childish and ignorant comments in all the videos….you do nothing but make a joke of yourself every time you open your ignorant tongue…. Thanks for keep-on updating information about OPT extension. I have doubt regarding OPT extension, Is government is favor to Non-immigrates & how much changes to get positive reply from government & also I heard about 6 years OPT extension, is this proposal also reviewing by DHS. I have doubt regarding OPT extension, Is government is favor to Non-immigrates & how much chances to get positive reply from government & also I heard about 6 years OPT extension, is this proposal also reviewing by DHS. Both Democrats and Republicans favor Legal Immigration. Thanks for reply to me. So, what about 6 years OPT extension, is it fake news or else this proposal also reviewing by DHS. There’s no credible source that confirmed 6 years. Maybe 2 years (yes). We have to wait and watch. Since DHS took over 45 days to submit it for review, I’m thinking there’s BIG changes in the rule. 2. One 24 months extension for those who did STEM in India but not doing STEM here. Raghu I appreciate your optimism – but shouldn’t we consider political impact here? With the 2016 elections due – do you think they will go ahead and favor immigrants over citizens? I seriously don’t think so. This rule may come into effect sometime after elections but may not be before that. There is a difference between the Rule and Law. Indian students will not come to USA if this rule doesn’t go through. It impacts U.S. Economy by multi-billions of dollars. I strongly think this will be done by Feb 12, 2016.
hello ragu , I appreciate u r concern regarding providing all the information for us . I have some few clarification , I hope you will answer.It may be silly please help me out. 1 .Msc in operational management comes under stem ? If it comes under stem than 12 month opt and 17 month extension , so altogether 29 months? 2. OPT will start after 3 months when we graduate ? 3. Regarding h1-b lottery, we will have only one chance for h1-b lottery , in case if we didn’t win lottery do we have go back? 1. Refer to CIP code or ask your DSO. 2. OPT start date can be requested. Hey Raghu.. I am on opt extension which will expire in first week of February 2016. I shall be benefited if this new rule comes up before that. But what if DHS feels that it will not be able to meet the deadline and asks for stay on the ruling? In that case what about people who have a hope of getting extra 7 months ( thereby one more H1B chance in April 016) what if stay order is vacated in march and 24months rule comes in march? I shall be on 60days of grace period so Will i be eligible for 7 months extension?